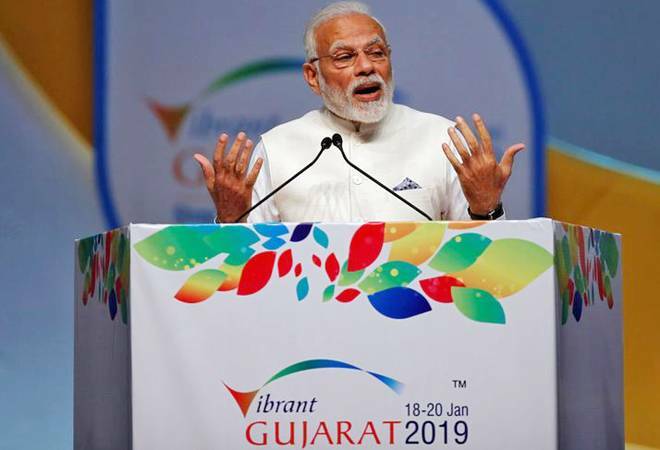 The Gujarat government signed around 130 MoUs with investment commitments worth over Rs 56,000 crore in various sectors on the first day of the Vibrant Gujarat Global Summit here Friday, said officials. A majority of the MoUs, also called Investment Intentions (IIs), were signed in the port and transport sector. China-based Tsingshan group committed to investing Rs 21,000 crore to set up a steel plant and a facility to manufacture car batteries in Dholera SIR, said the officials at a press meet. Besides this mega agreement, MoUs worth over Rs 35,000 crore was also signed during the opening day of the three-day business conclave which was inaugurated by Prime Minister Narendra Modi. A key MoU was signed with Petronet LNG Ltd with an intended investment of Rs 2,100 crore for expansion of their existing LNG Port Terminal at Dahej, said Sunaina Tomar, principal secretary, state port and transport department. “Another MoU was signed with HPCL Rajasthan Refinery Ltd with an intended investment of Rs 1,400 crore for development of Single Point Mooring System and Crude Oil Terminal at Mandvi,” she told reporters. An MOU was signed with Hindustan Petroleum Corporation Ltd with an intended investment of Rs 1,350 crore for LPG import facilities along with a jetty at Dahej Port and LPG cavern and pumping facilities at Ankleshwar, Tomar said. An MOU was signed with Adani Group with an intended cumulative investment of Rs 3,500 crore across three projects – development of a captive jetty at Kori Creek, cargo handling terminal at Mundra and Ro-Ro ferry facility at Mundra, she said. “A MoU was signed with Essar Group with an intended cumulative investment of Rs 7,485 crore across two projects – development of port-based Smart City and an LNG terminal at Hazira, the IAS officer said. Gujarat Pipavav Port Ltd (APM Terminals Pipavav) has expressed interest in the development of a Ro-Ro terminal at Pipavav, she said. “A tripartite MOU was signed between Gujarat Maritime Board, J M Baxi & Co and Port of Amsterdam with an intended cumulative investment of Rs 800 crore for development of cruise terminals at Mandvi, Dwarka, Porbandar and Verava,” Tomar said. An MOU was signed with Dahej Harbour and Infrastructure Ltd with an intended investment of Rs 700 crore for expansion of their existing port facility at Dahej, she added. Two Rajkot-based firms have also signed MoUs to set up artillery factories after getting clearance from the Centre, said Air Marshal R K Dhir, advisor to the Gujarat government for the aerospace and defence sector.